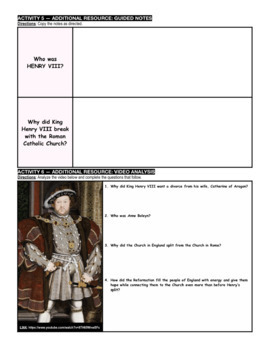 Why did King Henry VIII break with the Roman Catholic Church? ACTIVITY 1 -- DO NOW: Students will identify a leading villain in a popular movie they like. Students will explain what makes them corrupt and describe what would happen to them if they lost all of their followers. ACTIVITY 2 -- TEXT ANALYSIS: Students will read about how the Tudors came to power after the War of the Roses, which inspired Game of Thrones. They will then be able to identify the historical circumstances leading to Henry VIII's embracing of Martin Luther's Reformation. ACTIVITY 3 -- THINK-PAIR-SHARE: Students can work independently or in pairs to complete a task. 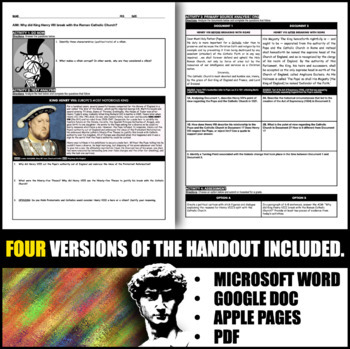 Students can create a newspaper article, a political cartoon, NYS Regents-level questions about the topic, or a very short one-act play with dialogue between Henry VIII, the Pope, and Martin Luther. 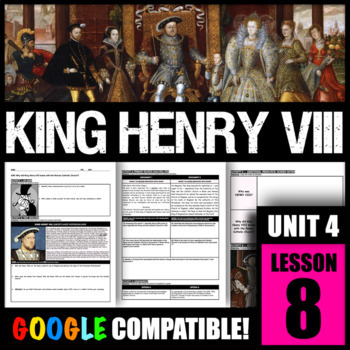 ACTIVITY 4 -- CRQ: Students will analyze a CRQ with two primary source documents to compare and contrast Henry VIII's views on Catholicism before and after his break with Rome. ASSESSMENT: Students may complete the CRQ for assessment, or answer the AIM using the R.A.C.E.S. format (FREE Download Here). 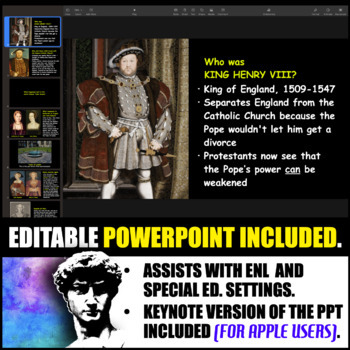 ADDITIONAL RESOURCE INCLUDED: PowerPoint with photos and slides with notes if that is your style. Some of my own photos from Hampton Court are included.